Usually, I like to support certain game developers due to the game experiences they put out. My philosophy is that if I like a game, I will support that developer or company. I don’t really care if they have done something stupid like an online pass or locked-on-disc DLC. Well, that last thing is annoying if the DLC isn’t free. However, if the game experience is better than the negatives I have for it, then that is good enough for me to support them. Some examples of companies or developers I support are Nintendo, Cyber Connect 2, Double Fine Productions, and Grasshopper Manufacture. Let us talk about the last one I mentioned because I know that company’s games are not always liked, but I think they offer unique experiences with their games, even though are not always popular with the mass public of gamers who can’t let go of their Skyrims or Call of Dutys. I really enjoyed the company’s unique experiences on action games from the No More Heroes franchise to the Tara Strong love note, Lollipop Chainsaw. I haven’t played Shadows of the Damned, but from what I have heard, people have, of course, mixed feelings about it, but enjoy it. This takes me to the developer’s recent downloadable titles like Sine Mora and today’s review, Black Knight Sword for the PS3 and 360 download marketplace. The main story of the game has this weird fairy-like creature bringing a human spirit who just recently hung himself back to life. It gets weirder when this fairy-like creature puts the dead spirit into a suit of armor belonging to this black knight. You are told in a prologue at the start-up screen that you are the reincarnation of a powerful knight and are sent off to fight this murderous princess and save the world. The whole game is told like a 2D puppet play, and it does have its charm, but the game’s story is one of its biggest problems. It isn’t told very well and there really isn’t anything special about the main hero. The enemies and the main big bad princess have personalities, but just like Alice Madness Returns, the main hero is rather bland. 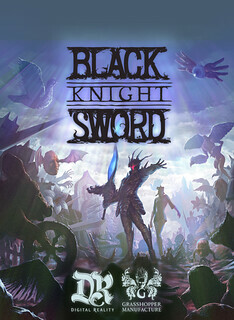 It is a shame too, since the entire world of Black Knight Sword is so creepy and atmospheric that you get pulled into its weird world. 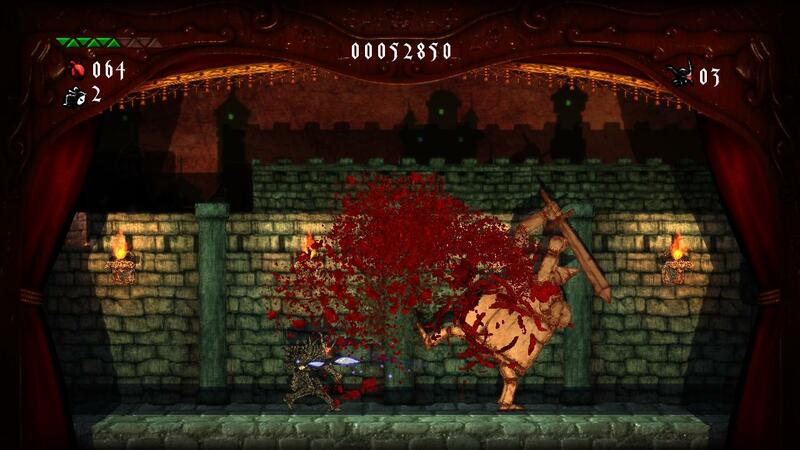 The gameplay is of an old-fashioned 2D side-scrolling action game with platforming elements. In terms of design, it is more along the line of games like Strider, Castlevania, and Ghost and Goblins. Most of the time, you just move from left to right in a linear fashion, striking down enemies, and fighting a boss at the end of the level. You are rather limited in terms of attack. You have an attack that goes straight, up, down, and diagonally. Later on, you gain the ability to get stuff like magical attacks, armor that lets you take a few more hits, and gain more health. The level variety is actually a nice change of pace. The levels have some decent variety to them, and not one level looks the same. Sadly, there is no co-op mode or anything, and the game can be on the short side for about 5-6 hours or less, depending on how fast you can get through the game and its rather tough difficulty. If you love games like Ghost and Goblins, Strider, and the first and third NES Castlevania, then I think you will be right at home with this retro-style action game. The best part of this game is its graphical presentation. It all takes place on a stage, like the upcoming PS3 title, Puppeteer. All of the characters look like those 2D wooden puppets, mixed with a bit of those 2D cartoons from the Monty Python series. There is also this really unsettling atmosphere to the game. The little substories have rather dark tones to them, and there is just something incredibly creepy about the levels. It’s hard to explain, but you know that feeling you get when you play Siren, the first 3 Silent Hills, or any horror game where you are just moving slowly and have that unnerving feeling in your body that something is about to scare the daylights out of you? Yeah, this game has that atmosphere. It isn’t really meant to be a scary game, but the music, graphical presentation, and character design really make this game unique. The game’s atmospheric music was composed by Akira Yamaoka. You would, of course, recognize him from his work on the early Silent Hill games, Shadows of the Damned, and the upcoming Killer is Dead. So, what is wrong with this game? Besides the story being nonexistent, there are a few issues I have with this game. The Black Knight character is rather bland, and while it looks cool, he is too dark to see his entire body, so any personality is wasted since you can’t see any facial movements or anything else from the character. He is also a bit too big, and the result of this is that he can easily take some cheap hits and hit the walls of platforms. The levels at times are not designed around his size, and it leads to some tedious platforming from time to time. I have gotten hurt or died more times than I would like to admit, due to being too big to jump across a platform without hitting something. Sometimes the enemies aren’t designed to be taken out by your attacks, due to the limited angles you can attack in.